Developing SSIS packages is quite easy – it’s mostly drag and drop and some minor configuration, which is a really boon for someone who is new to SSIS. However, when it comes to tuning the package, one needs to understand the finer points of each task on the control flow. On each task, there are some options that help improving the performance of the data flow, whereas some others help regulate the quality of data being migrated. Today, I will take a look at the “Check Constraints” option which controls the quality of the data “flowing” through the data flow task. Constraints that enforce referential and domain integrity are a physical implementation of the entity relationship and logical database design. As businesses grow and system architectures evolve, valid values for various enumerations also change and evolve. Values valid for a domain are enforced in the physical design via CHECK constraints. Historical data may or may not confirm to the values enforced by current CHECK constraints today. For example, an expense workflow may have multiple stages which may not have existed in the past. While current data in the transaction systems would have been updated to confirm to the new enumerations, the historical data may still be as-is, i.e. valid in the past, but invalid today. When moving such data over to a warehouse, the data transfer is a bulk data movement. By default, Microsoft SQL Server does not check constraints when loading data in bulk. SSIS allows you to control this behaviour when using the OLE DB transformation. These checks are enforced by using CHECK constraints, and the DDL is provided below for your kind reference. In my SSIS package, I have used a standard data flow task. The OLE DB source uses a query that creates some valid and invalid data which I would like to insert into the destination [dbo]. [UserRegistration] table. Below is the T-SQL query used for the source and screenshots of my data flow task. Notice that by default, the CHECK Constraints checkbox is checked. When I run the package by keeping CHECK constraints enabled, the package fails during execution. Looking at the package progress log, I can confirm that the package failed because the data violated check constraints when inserting into the table. The error has been formatted below to enhance readability. [Insert into UserRegistration table ] Error: SSIS Error Code DTS_E_OLEDBERROR. An OLE DB record is available. 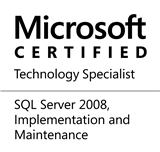 Source: "Microsoft SQL Server Native Client 11.0"
Hresult: 0x80004005  Description: "The statement has been terminated.". Description: "The INSERT statement conflicted with the CHECK constraint "chk_UserRegistrationUserEmail". The conflict occurred in database "tempdb", table "dbo.UserRegistration", column 'UserEmail'.". I now edit the package to uncheck the “Check Constraints” checkbox on the OLE DB Destination. Running the package again results in success. I now validate the data in the [dbo]. [UserRegistration] table. I can see that data violating check constraints was successfully inserted. The OLE DB destination task is a very powerful way to load data into SQL Server table in a short duration of time. At the same time, it can also cause bad data to be inserted into the destination if not used wisely. This entry was posted in #SQLServer and tagged Administration, DBA, Series, SSIS, Tips, Tools and Utilities on October 31, 2016 by nakulvachhrajani.